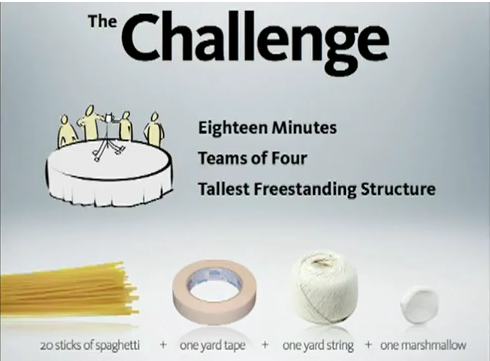 Here’s the gist: In eighteen minutes, teams of three to four must build a freestanding structure out of twenty pieces of spaghetti, one yard of string, and one yard of tape. The structure needs to support the weight of one marshmallow without collapsing, and the tallest successful design wins. TED Talks has a great video that further explains the challenge and the ideology behind it. So, how did we do? Out of four teams, only one, fielding players Greg Baugues, Matt Lineen, and Micah Gates, managed to build a standing structure. We consider ourselves pretty smart, capable people, so why the poor results? We realized that, in building these structures, we tended to overthink our designs in an attempt to find the “perfect” solution, rather than experimenting and making adjustments as needed. It got us wondering how we could keep expanding the iterative methodologies we use to achieve even better outcomes for our clients. "Well, yeah, and if we had Lincoln Logs instead of spaghetti...but those weren't the constraints." Interestingly, when one team was granted five more minutes, their structure still wouldn’t stand. This called attention to how difficult estimation can sometimes be. The challenge was a fun one that yielded some great discussion, and we recommend others give it a go. You may just learn, like we did, that sometimes the pursuit of one perfect solution can lead to no solution at all, while answers that are adaptable, fluid, and "good enough" can give rise to very strong results.